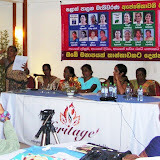 WMC held a press briefing at Cinnamon Grand, Colombo on the 9th of February 2011 to present the female candidates who will contest for the upcoming Local Government elections in the country. 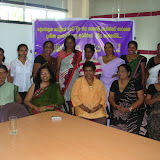 These women are those who were presented by the Women and Media Collective with the aim of increasing nominations and votes for women for the LG elections from 5 chosen districts — Kurunegala, Monaragala, Badulla, Galle and Trincomalee. 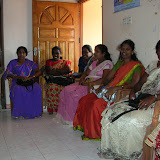 In total 181 women were put forward by WMC and 72 were successful in receiving nominations. At the press briefing candidates were given and opportunity to introduce themselves and share their experiences, leading up to the nominations, to the mainstream media personnel. Approximately 195 local level party leaders from mainstream political parties in all five districts and 48 national level party leaders were met by the WMC to ensure that an equal amount of women are also in the decision making process in the country. 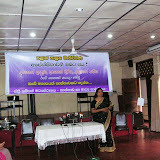 A media briefing was held on the 17th of February 2010 where all party representatives addressed the media on issues related to women’s representation at elections and in particular about increasing the number of women nominations for the upcoming parliamentary election. Some of the speakers at the event included Western Provincial Council MPs Ashoka Lankathilake and Rosy Senanayake and Central Provincial Council MP Shanthini Kongahage.